Jim Jennings tells TheJournal.ie about how he replaced Pat Kenny and what needs to be done to get more female voices on the radio. EVERYTHING FROM PROGRAMME staffs to the amount spent on newspapers have been reduced at RTÉ Radio in recent years but Jim Jennings admits that it’s been very difficult to reduce costs given what’s already been cut. The acting managing director of RTÉ Radio spoke to TheJournal.ie this week about the difficulty in cutting spending and the impact it has been having behind the scenes. “We’ve reduced the size of programme teams, we have cut budgets, nobody gets mileage anymore, there are all sorts of things, even simple things like newspapers. We have looked at everything,” he said. “We have looked under every stone here in terms of what we can save, it’s an ongoing process to be honest with you, I’m still at it. I just came from a meeting and it’s about more cuts. He said that “the more crafted areas” of RTÉ Radio such as education and science programmes as well as drama have all been cut back in the past year in addition to some 500 staff being let go in the last two to three years. But the most public upheaval has been the recent departure of Pat Kenny. Jennings insisted the station had been preparing for the possibility that Kenny would depart as he ended up doing. “It didn’t come as a huge shock I suppose to me as it did to other people,” he said adding that he would have preferred if Kenny had stayed. Jennings said that he always had Seán O’Rourke in mind for the role and flat out denies claims that RTÉ sought a replacement presenter from outside the station. “From day one we just looked internally, I mean we believe and I believe that we have good talent here within RTÉ,” he said. Jennings said the beauty of the new arrangement – with O’Rourke going head-to-head with Kenny over on Newstalk – is that nobody knows what’s going to happen. “I don’t think there’s been a move like this before. So anybody who is making predictions about it are kind of guessing to be honest with you,” he said. He suggested that some people who did like not Kenny may now decide to tune in to Radio 1 and pointed that its audience is a loyal one. He believes the first big test of the new setup will be when there is a breaking news story. “I actually think they will tune in to Radio 1 first, that’s been the tradition when big national events or big things are happening,” he said. One of the criticisms of RTÉ Radio and its news and current affairs output in general is the lack of female voices. Jennings pointed to the many female voices presenting on Radio 1 but said that with regards to programme guests to some extent the onus should be on the Women on Air group to do more. “Our programmes that are following the news agenda, they rely a lot on political parties and public bodies and companies to nominate people as interviewees. If you just look at the gender balance in the Oireachtas, it’s very difficult to get gender balance that is 50-50 in terms of debates. The RTÉ veteran concluded that the recent shake-up in the Irish radio scene meant that people were talking about it and radio has been “put on the map”. “I mean how many times a year do you actually get to talk about radio? How many times a year is radio an event like this, being talked about around the country?,” he said. Read: Why did Shirley Bassey’s singing interrupt Morning Ireland’s 7am news bulletin? Email “RTÉ Radio chief: 'We've looked under every stone to try and make savings' ”. 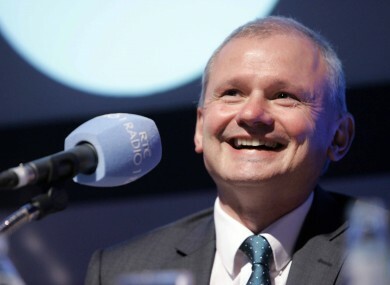 Feedback on “RTÉ Radio chief: 'We've looked under every stone to try and make savings' ”.